There are quite a few herbs that come with reputations. Many of them are well earned, Saw Palmetto is one. It has a reputation for being a great herb for men, and it certainly is. However, it's also great for women in certain conditions. 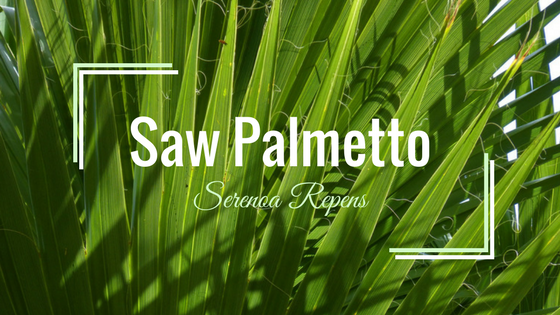 Living in Central Florida, you can't help but find Saw Palmetto, Serenoa serrulata or Serenoa repens, just about everywhere. They are a staple food for much of Florida's native wildlife, including bears. This is why we keep having bear problems in the neighborhoods around Central Florida, in order to build the neighborhoods, we had to destroy acres of Saw Palmetto growth. The bears come back to these pieces of land year, after year, looking for their favorite food, and all they find is a neighborhood full of humans and their waste. We've traded a healthy food source for them, for an unhealthy dependence on humans and trash. Saw Palmetto can also be a decent food source for us. Not only are the berries edible, but Saw Palmetto is an alternative source of hearts of palm. The Cabbage Palm (also known as Sable Palm, and happens to be Florida's state tree) has a very tasty “heart,” but you have to kill the young tree in order to harvest. Cabbage Palm is now protected, which makes it illegal to harvest this tasty “heart.” However, Saw Palmetto leaf stalks can be harvested without harming the plant, and they taste virtually the same as heart of palm. It is a rough process, but heart of palm is so tasty and is a great addition to salads. Here are a couple of good videos about harvesting Saw Palmetto berries and hearts. But back to the benefits. Saw Palmetto has gained a great reputation for helping men with prostate problems, hair loss, and other age related issues. While it does boost testosterone levels, it is also great for women who are dealing with hormonal issues such as polycystic ovarian syndrome (PCOS) and menopause. It also helps strengthen the urinary organs, and helps protect the prostate. This makes Saw Palmetto a great herb to help prevent some of the effects of aging. Known in TCM as Ju Ye Zong, Saw Palmetto is used much in the same way as in Western herbalism. In Chinese Medicine, Saw Palmetto works most directly on the kidney and lung meridians. It boosts Jing, tonifies Kidney Qi, reduces inflammation (especially of the sexual and urinary organs), expels phlegm, and supports Lung Qi. While Saw Palmetto is native to the West Indies and America, specifically on the East Coast from the Carolinas down to Florida, it is gaining a huge reputation in other countries as well. Ayurvedic medicine has taken up the use of this herb in much the same way it's used in the Western Traditions, for helping keep the prostate healthy and reduce some of the effects of aging. One of the leading concerns of men, as they age, is prostate health. Prostate cancer is a huge part of that concern, and it seems to be connected to enlargement of the prostate. Saw Palmetto helps prevent the enlargement of the prostate, helping to keep the prostate healthy and decreasing the risk of developing prostate cancer. Saw Palmetto helps to balance testosterone levels. It also helps to block the enzyme that converts testosterone to dihydrotestosterone (DHT), which is the primary cause of hair loss, hair thinning, and baldness. Saw Palmetto is useful to help reduce inflammation in the urological system. It helps keep the kidneys healthy, reducing the formation of kidney stones, and helps reduce frequent urination. Some studies also show that Saw Palmetto can help treat bladder disease. PCOS drastically effects a woman's hormones, causing quite a few health problems including infertility, trouble loosing weight, and the development of cysts in the ovaries. Saw Palmetto helps balance hormones, reducing the symptoms of PCOS, and helping to prevent certain health conditions associated with this particular hormone imbalance. During menopause, estrogen and progesterone levels drop, however testosterone levels remain the same. Saw Palmetto helps to reduce testosterone levels, helping to ease quite a few of the menopausal symptoms associated with this imbalance. Saw Palmetoo also helps to prevent the weakening of vaginal and uterine tissues. Acne is often associated with changing hormone levels in adolescents. However it can also be caused, later in life, by other hormones such as testosterone. Hirsutism is a condition where women grow hair in unusual places, such as on their face. This is also typically caused by excessive testosterone levels. Saw palmetto can help minimize the amount of testosterone produced by women which can help reduce acne and unwanted hair growth. Saw Palmetto may interact negatively with certain medications. Always consult with your doctor while taking any herbal supplements. There are also a few side effects that may occur while taking Saw Palmetto supplements. These may include dizziness, nausea, diarrhea, and constipation. Saw Palmetto should not be given to prepubescent children as there is some question about it triggering early puberty symptoms. Saw Palmetto should also be avoided during pregnancy and breast feeding. I only included a basic introduction to this amazing herb. I hope you have learned a new appreciation for saw palmetto. If you have any questions or comments, please leave them below.